The prospect of enjoying sunnier climes and a more laidback lifestyle are a couple of reasons why buying property in Australia is so popular. But making the move Down-Under and investing in local real estate requires a lot of planning. As well as organising things like your visa and finding the Australian property of your dreams, you’ll need to consider how you plan to manage your international currency payments to and from Australia. Whether your currency transfer requirement is large or small, benefitting from excellent exchange rates and fee-free transfers can make a big difference. By keeping on top of the latest Australian Dollar exchange rate news with our handy market updates you can plan to move your money abroad at the most opportune time and have the maximum amount to spend on your Australian property. Our Account Managers are also on hand to provide expert market insights and explain the options available to you. Whether you’re looking to buy property in Sydney, Adelaide, Melbourne or Brisbane, our competitive exchange rates and specialist services (like being able to fix a competitive exchange rate up to two years in advance) mean you can budget effectively and could save thousands on your purchase. Emigrating to Australia? 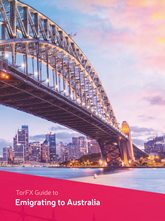 Our free guide is full of top tips to help you navigate the foreign property market and provides useful information on subjects from locations to moving your money.